Minva themes has been purchased 16, rating: 4/5 based on 3 reviews. 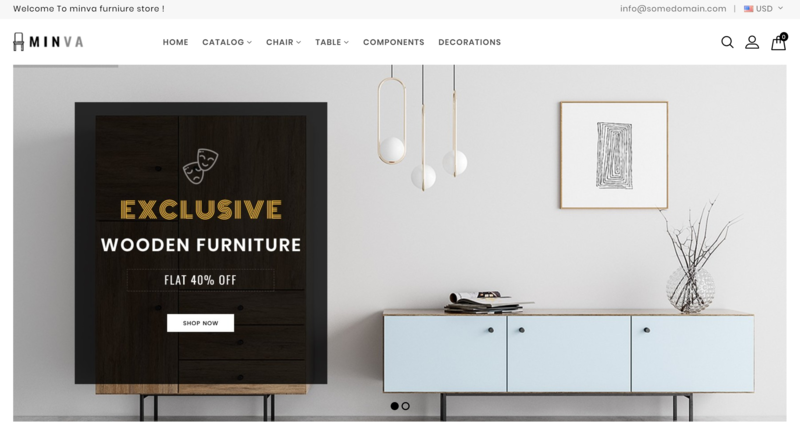 Minva - The Furniture Shopify Theme, which is designed by the webibazaar team, is a well-fitted theme for many online stores about fashion, Jewellery, Cosmetic, Home appliances, Bag, Organic, Resturant, Watch, Fashion, Ceramic, Flower, Shoes, Power-Tool, Pet-Store. Coming with a simple and clean layout together with well-organized design, Minva can make it easier for you to attract visitors at first sight. This theme is entire user-friendly so it is very simple for your customers to take any actions. Furthermore, it can also be displayed nicely on various types of devices so please do not worry to run it on your phone or desktop. Let it be yours with just one click only!